An F-35B Lightning II with Marine Fighter Attack Squadron (VMFA) 121 touches down on the amphibious assault ship USS Wasp (LHD 1), marking the first time the aircraft has deployed aboard a U.S. Navy ship and with a Marine Expeditionary Unit in the Indo-Pacific region. VFMFA-121, assigned under the Okinawa-based 31st Marine Expeditionary Unit, will remain embarked aboard Wasp for a regional patrol meant to strengthen regional alliances, provide rapid-response capability, and advance the Up-Gunned ESG concept. 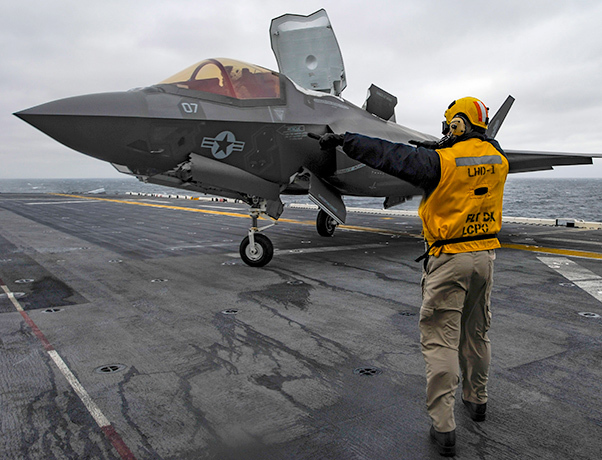 A detachment of F-35B Lightning II’s with Fighter Attack Squadron 121 (VMFA-121) arrived aboard the amphibious assault ship USS Wasp (LHD 1) March 5, marking the first time the aircraft has deployed aboard a U.S. Navy ship and with a Marine Expeditionary Unit in the Indo-Pacific. VMFA-121 Pilots are scheduled to conduct a series of qualification flights on Wasp over a multi-day period. 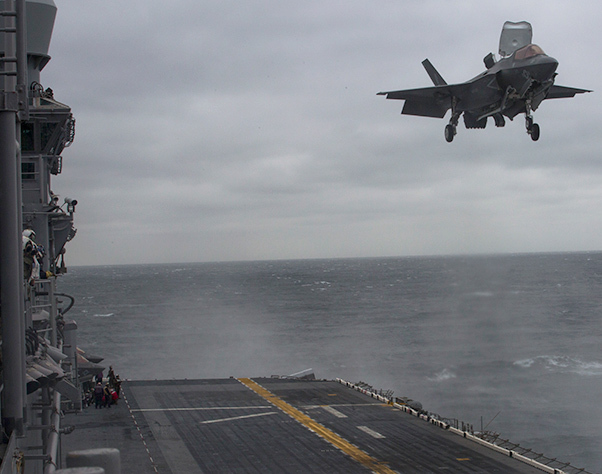 Following qualifications, the F-35B’s and 2,300 Marines that make up the 31st MEU will deploy aboard ships of the Wasp Expeditionary Strike Group for follow-on operations in the Indo-Pacific region as part of a routine patrol to strengthen regional alliances, provide rapid-response capability and advance the ‘Up-Gunned ESG’ concept. The ‘Up-gunned ESG’ is a U.S. Pacific-fleet initiated concept that aims to provide lethality and survivability to a traditional three-ship amphibious ready group by integrating multi-mission surface combatants and F-35B into amphibious operations. 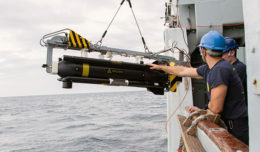 By adding these enabling capabilities, the amphibious force can more effectively defend against adversarial threats in the undersea, surface and air domains, as well provide offensive firepower to strike from the sea. The 31st MEU is the only forward-deployed MEU in the region. 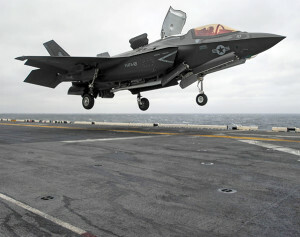 The F-35B serves as one airframe within a multitude of air capabilities of the MEU’s Air Combat Element. 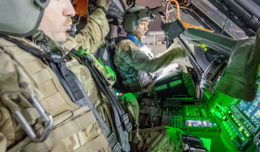 Air, ground and logistics forces make up the MEU’s Marine Air-Ground Task Force (MAGTF), a composite of capabilities that allow the MEU, in partnership with Navy amphibious ships, to conduct a wide-range of missions from crisis response to disaster relief. Multi-mission guided-missile destroyers USS Dewey (DDG 105), with embarked Helicopter Maritime Strike Squadron (HSM) 35 “Magicians,” and USS Sterett (DDG 104), with embarked Helicopter Maritime Strike Squadron 49 “Scorpions,” are scheduled to support a range of operations and training with the Wasp Expeditionary Strike Group for varying stretches during the patrol. Chief Aviation Boatswain’s Mate (Handling) John Jacob directs an F-35B Lightning II with Marine Fighter Attack Squadron (VMFA) 121 on the flight deck of the amphibious assault ship USS Wasp (LHD 1), marking the first time the aircraft has deployed aboard a U.S. Navy ship and with a Marine Expeditionary Unit in the Indo-Pacific. VFMFA-121, assigned under the Okinawa-based 31st Marine Expeditionary Unit, will remain embarked aboard Wasp for a regional patrol meant to strengthen regional alliances, provide rapid-response capability, and advance the Up-Gunned ESG concept. Seventh Fleet, which celebrates its 75th year in 2018, spans more than 124 million square kilometers–stretching from the International Date Line to the India/Pakistan border and from the Kuril Islands in the North to the Antarctic in the South. Seventh Fleet’s area of operation encompasses 36 maritime countries and 50 percent of the world’s population with between 50-70 U.S. ships and submarines, 140 aircraft and approximately 20,000 Sailors in the 7th fleet.